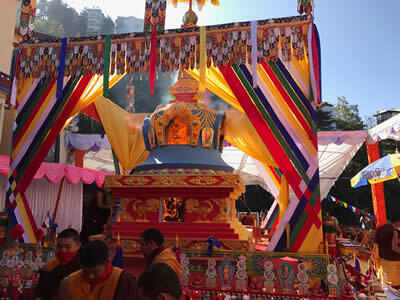 Mindrolling Jetsün Khandro Rinpoche and members of the Mindrolling Sangha recently traveled to Shimla, India to attend and make offerings during the cremation of the kudung of Kyabje Taklung Tsetrul Rinpoche which took place on the 19th October 2017. Over the years, the worldwide Mindrolling sangha has been most fortunate to be in the presence of and receive teachings and empowerments from this great master. In 2018-09 Rinpoche bestowed the four-month long Rinchen Terdzod empowerments at Mindrolling Monastery. Then in 2010, Rinpoche bestowed the Kunzang Gongpa Zangthal (Northern Treasure) empowerments at Mindrolling Lotus Garden. Please visit Jetsün Khandro Rinpoche’s Facebook page to view photos and videos from creation ceremony. Please note that you do not have a Facebook page of your own to view Rinpoche’s Facebook page.